GRAFENWOEHR, Germany — The Army garrison here kicks off this year’s motorcycle season with motorcycle safety days at Grafenwoehr and Garmisch May 5. “Featuring motorcycle and apparel checks, riding drills and a joy ride, the motorcycle safety day is conducted to heighten the awareness of motorcycle safety from the perspective of the rider and improve overall safety considerations,” said Leo Lear, Safety Chief for the U.S. Army Garrison Bavaria Safety Office. Hosted by the garrison safety office, these events are geared toward all active-duty DOD ID cardholders at USAG Bavaria, which include installations at Grafenwoehr, Vilseck, Hohenfels and Garmisch. However, all DOD ID cardholders are welcome to attend. Grafenwoehr’s motorcycle safety day begins with a safety run-down May 5 at 8:30 a.m. at Camp Kasserine, Bldg. 4114. The safety event in Garmisch begins at the same time at the Artillery Kaserne’s Motorcycle Safety Range. Both events conclude with a mentorship ride in the afternoon. Morning events include the introduction of the unit’s motorcycle mentors and safety briefings. After lunch, participants are split into sport bike and cruiser bike groups of four to 10 riders. Riding drills and the extended joy ride round out the day’s activities. The drills include demonstrations and practice of components of total stopping distance, practice in obstacle avoidance, and evasive maneuvers providing riders with the opportunity to improve skills in breaking, cornering and swerving. Many chip in to make the motorcycle safety day a success. 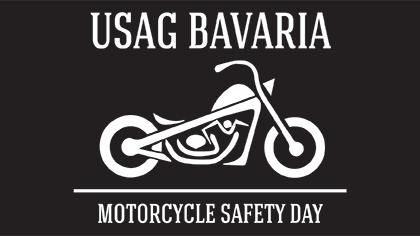 “We have a great motorcycle safety program here at USAG Bavaria. We receive outstanding support from our tenant units and host nation agencies,” said Wolfgang Pueschel, event organizer and garrison safety specialist. Most units have volunteer mentors — capable and experienced motorcyclists — providing less seasoned riders with advice and information on safe driving. At the Grafenwoehr event, the 405th Army Field Support Brigade ensures that a professional mechanic is on hand to inspect motorcycles. Representatives of the German police are available to answer questions concerning German law and motorcycle safety. A member of the Bavarian Red Cross volunteered to participate in the day’s events providing first aid expertise. “Of course, DOD ID cardholder motorcyclists are required to abide by German law, the Army’s and the Army in Europe’s safety program regulations but there is an additional requirement to wear reflective apparel for motorcycle operators and passengers,” Pueschel said. “We want to re-emphasize and improve safety awareness of our two wheeled drivers before the motorcycle season is in full swing,” said Lear. The USAG Bavaria Hohenfels community hosted a motorcycle safety day April 18. This motorcycle season, events in Bavaria include the Sternfahrt bike rally April 29 and 30 hosted by the Bavarian Ministry of the Interior and the Upper Franconian Police Headquarter. Edelweiss Resort’s annual Poker Run, where nearly 400 bikers from around Europe ride along scenic Alpine routes, takes place June 23 – 25. Grafenwoehr also has a Poker Run organized by military veterans May 13 at 9 a.m. at the Rebels Clubhouse. The safety office is looking for volunteers to assist. For more details on motorcycle safety and the Motorcycle Safety Day, or if you want to volunteer, visit the safety page or contact the garrison safety office at DSN 526-2306, CIV 09641-70-526-2306.